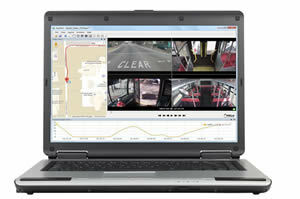 Ruggedized mobile network video records (NVRs) will be introduced by IDIS® for reliable, high definition recording in the transportation sector. The DR-6308PM and DR-6361PSM recorders are ideal for use in public transport and other applications where interior and exterior vehicle activity needs to be captured in dependable, high resolution. Featuring a durable, anti-shock and anti-vibration design (U.S. military MIL-STD-810 approved) the new models overcome the problem of noise and inconsistent image quality that can affect standard recording devices in challenging, mobile situations. The automatic data backup over Wi-Fi simplifies integration into any centralised monitoring system. A dual track recording feature also maximises storage capacity. Users can choose to store recordings of particular incidents at the highest quality, along with standard quality recordings of general video footage for longer retention. The new mobile NVRs offer 480ips at 4K UHD recording performance (for all 16 channels), H.265 and H.264 dual codec support and 210Mbps of recording bandwidth. Other specialist features include a 3-axis accelerometer that detects emergency stops and starts, integrated power supply and isolated power block that protects internal circuitry to ensure that data is not lost during loss of power or an overvoltage event. Giving users maximum operational choice the mobile NVRs also come with the option of the feature rich IDIS Center video management software (VMS) – a free, powerful, customisable management system that supports up to 1024 devices - or the enterprise-level IDIS Solution Suite, which offers a modular design, cost-effective license structure and zero software maintenance agreements. Totally cost-free IDIS Center VMS features include map monitoring, which displays vehicle status information (position, speed, etc.) and allows recorded video to be viewed with a single click; system health monitoring; accelerated configuration; power management and dual stream recording.